Ladies and gentlemen this is Network theatre. Established in Orwells ’84’ fifty years after the birth of its ancestor ‘Merseyside Left theatre group’, Network was created after the closure of ‘Merseyside Unity Theatre ‘ and strives every Tuesday to continue encouragement, participation, performance and innovative theatrical writing for Liverpool. See also the earlier post, Three Unities. Some images from the great Hope Street Feast on 18th September. There was a marvellous range of foods, of course, and the atmosphere was wonderful as all ages enjoyed what seemed like never-ending entertainment. Songs, music, street theatre, dance and more than a touch of the surreal throughout the day. The Philharmonic Hall was open for children’s films, young people’s performing music and song, the Royal Philharmonic Choir, and performances from folk, to Chinese and Irish artists sharing their culture. Sole artists and duest performed songs at the Mount Street and Myrtle Street stages. The Masonic Hall was open for tours, as was the former Irish Centre, now sadly derelict. Local venues for smaller events included the Caledonia and the Hope Street Hotel. You’ll get a taste of the day watching the short video which will be our next post. We mark the end of the first phase of our Hope Street Chronicles project with this event. It has to be said that we haven’t included even half of what we intended. We have an archive now of posts including pictures, stories, poems and histories waiting to be published when time permits (We only meet two hours a week). And there is more and more new stuff suggesting itself every week. It’s been fascinating, and a great learning process, to see how much thre is to be discovered from one street. While the area has been so developed over the past 20 years – with new road surfaces, pavements, statues, installations, restaurants, hotels – the street sign itself seems to speak of an older, more neglected history. Placed in a museum as a sign of historical importance, this sign suggests an attachment to a place, like Penny Lane. It’s scrawled on, has scratched onto it layers of expression, each layer like a witness to a different history. Someone has turned this into “No Hope”place. Others have added their own messages. The sticker in the top left is to do with treasure hunting – using mobile phones to find clues. We are going to organise our own treasure hunt at Hope Street Chronicles : people will be able to add stories, facts, responses, comments to each object they find. Hope Street, yes. But this one’s in Glasgow. Same words, different reference. 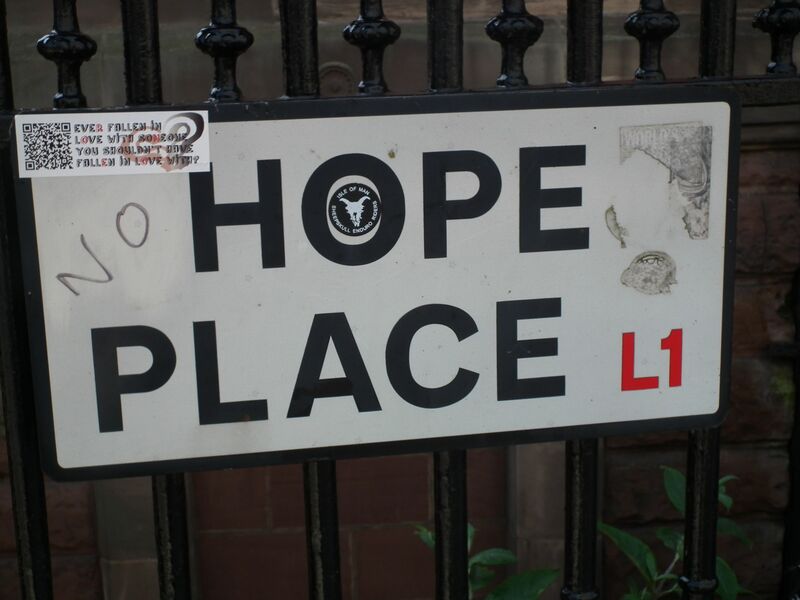 We are producing a short video called From Hope to Hope about a man who travels from Hope Street in Glasgow to Hope Street in Liverpool looking for a new start. 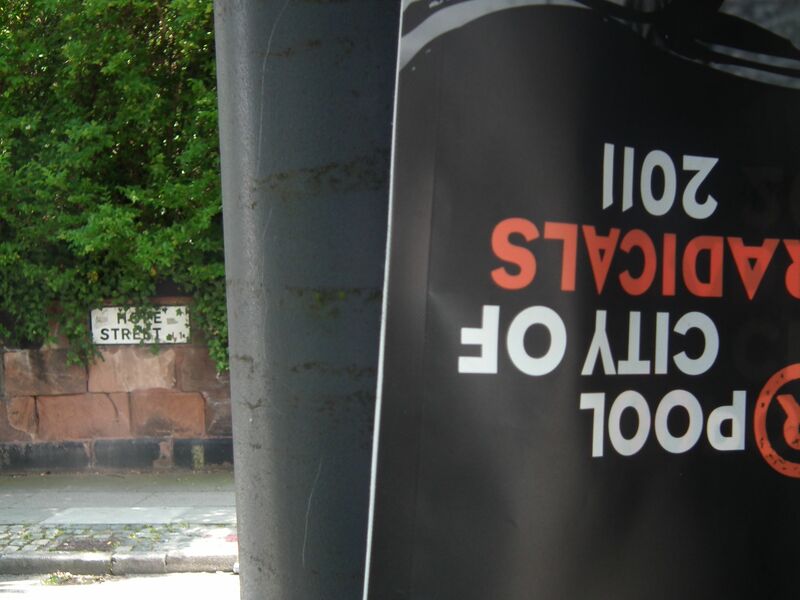 One sign of today proclaiming 2011 as the year of the City of Radicals has fallen forlorn. 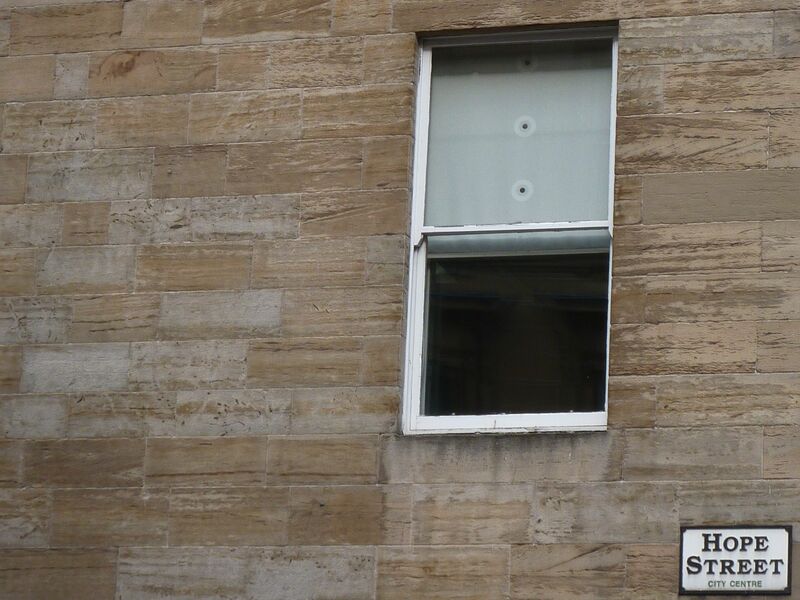 The street sign is content to be partly hidden but sure of its more permanent nature. The verdigris is a sign of time wearing things away. The ‘postcard’ is not one you’d be likely to send but maybe it makes us think about how we distinguish between trying to show something in a pleasant light, and showing it in a different way, her, for instance, a little bit sad. 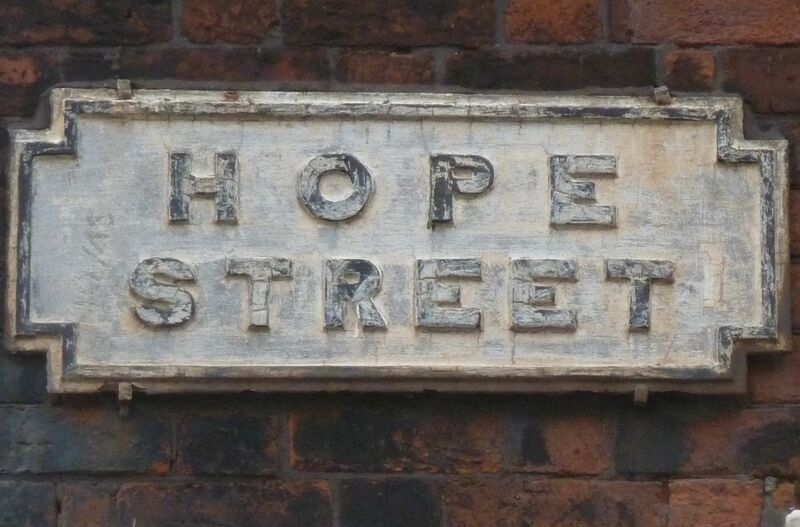 The identification of Hope with Hope Street has a long history. 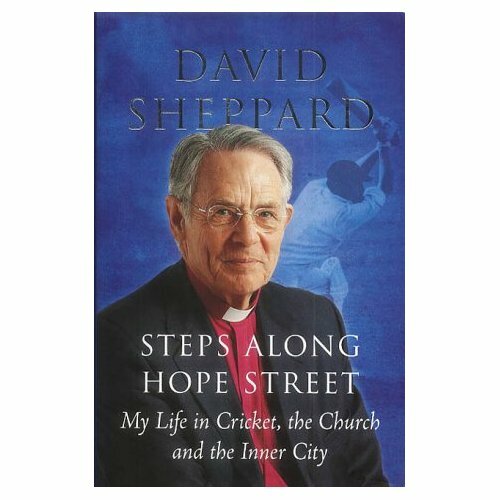 Bishop Sheppard and the Catholic Archbishop Derek Worlock organised many walks between the two cathedrals. A statue now commemorates their work together about half way down Hope Street. (We’ll be looking at this subject and the work of the two men soon). Both men were key figures in founding what is now Hope University. The two of them wrote a book called With Hope in Our Hearts. 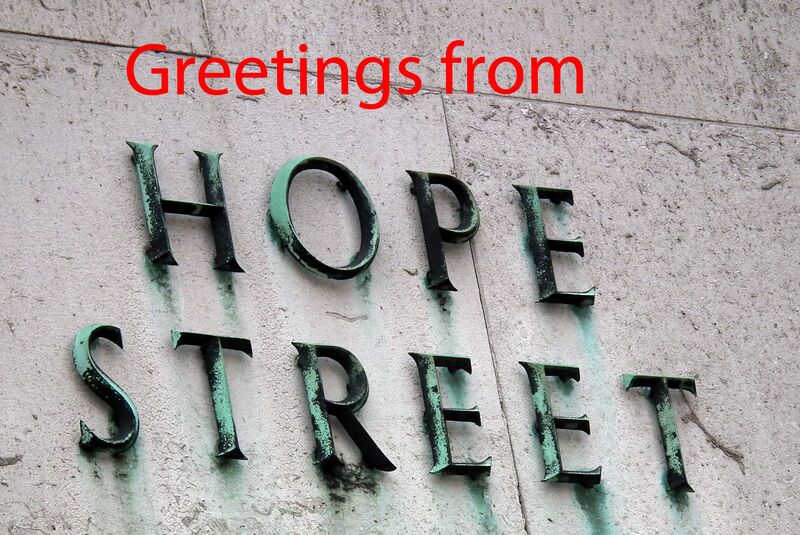 So Hope and Hope Street, the only road with a cathedral at both ends, is well established. 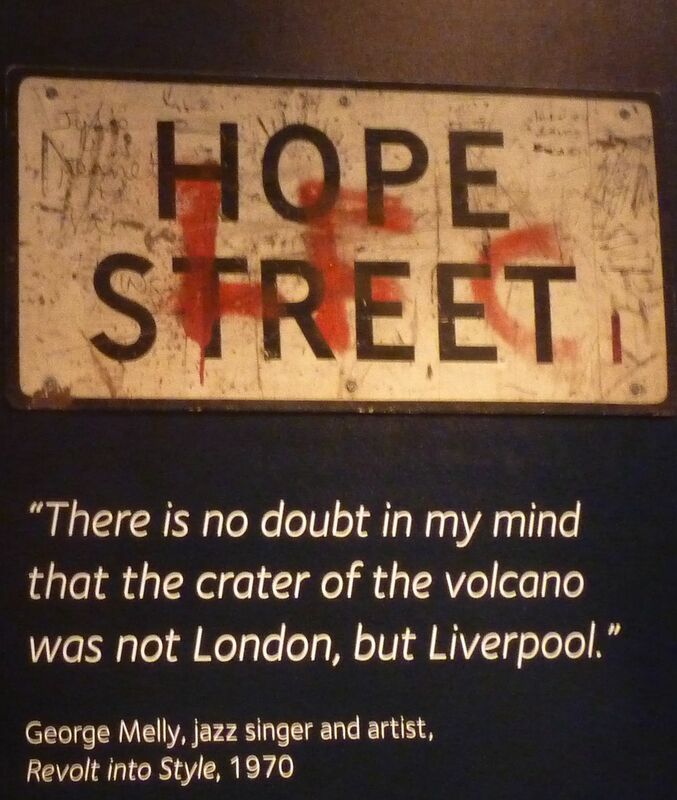 The fact is, of course, that the street is named after a Liverpool merchant, William Hope, whose house stood where the Philharmonic pub is now.